Serum levels of the main endocannabinoids, N-arachidonoylethanolamine (AEA or anandamide) and 2-arachidonoylglycerol (2-AG), and their related endogenous compounds, arachidonic acid (AA), N-palmitoylethanolamine (PEA), and N-oleoylethanolamine (OEA), were analyzed by liquid chromatography/tandem mass spectrometry in 93 children with ASD (age = 13.1 ± 4.1, range 6–21; 79% boys) and 93 age- and gender-matched neurotypical children (age = 11.8 ± 4.3, range 5.5–21; 79% boys). Results were associated with gender and use of medications, and were correlated with age, BMI, and adaptive functioning of ASD participants as reflected by scores of Autism Diagnostic Observation Schedule (ADOS-2), Vineland Adaptive Behavior Scale-II (VABS-II), and Social Responsiveness Scale-II (SRS-2). We found lower serum levels of AEA, PEA, and OEA in children with ASD. Further studies are needed to determine whether circulating endocannabinoid levels can be used as stratification biomarkers that identify clinically significant subgroups within the autism spectrum and if they reflect lower endocannabinoid “tone” in the brain, as found in animal models of ASD. Cannabis has a well-known effect on social behavior in humans . It enhances interpersonal communication  and decreases hostile feelings . The principle unique compounds in the cannabis plant (phytocannabinoids) are Δ9-tetrahydrocannabinol (THC) and cannabidiol (CBD). The main target of THC in the brain is the cannabinoid type-1 receptor (CB1R), which is highly expressed in the frontal cortex and subcortical areas associated with social functioning . The CB1R and its endogenous ligands N-arachidonoylethanolamine (anandamide or AEA) and 2-arachidonoil-glycerol (2-AG) regulate social play and anxiety in animal models [5–7] and in humans [8, 9]. Pharmacological and genetic experiments in animal models suggest that social reward is regulated by oxytocin-dependent activation of the endocannabinoid system (ECS) in the nucleus accumbens, the primary rewarding center in the brain . Moreover, the ECS is a major regulator of synaptic plasticity (excitatory and inhibitory) through long-term potentiation and long-term depression . 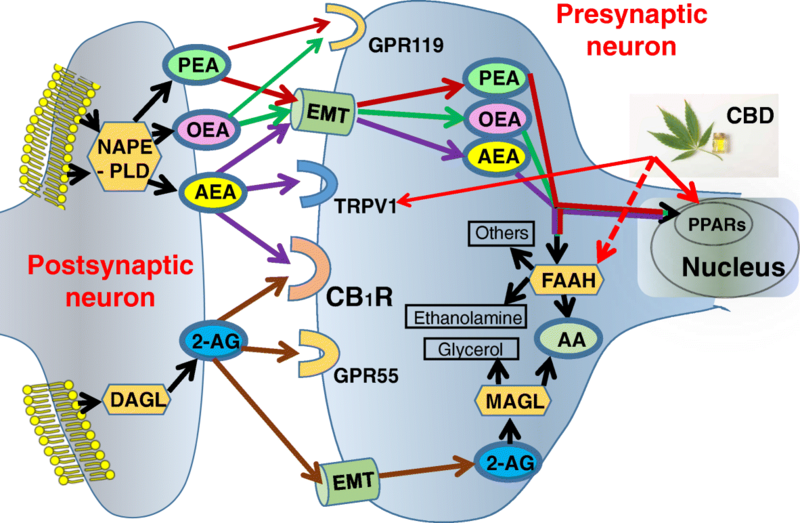 Endocannabinoids (AEA and 2-AG) are usually produced “on demand” in the post-synaptic neuron and act as retrograde signaling messengers. By activating CB1R in the pre-synaptic neuron, both endogenous ligands result in decreased release of neurotransmitters into the synaptic cleft and attenuate over-active brain circuits . Reduced endocannabinoid “tone” was suggested to be involved in the pathogenesis of ASD in several animal models: monogenic (fragile X [12, 13], neuroligin 3 ), polygenic (BTBR ), and environmental (rat valproic acid [16, 17]). Activation of the ECS in these and other models of ASD reversed the autistic symptoms [13, 15, 17–23]. Several human studies revealed associations between polymorphisms in the gene encoding CB1R and emotions’ processing [24–26]. Other studies demonstrated reduced expression of CB1R in postmortem brains of individuals with autism  as well as reduced plasma AEA levels in children with ASD . However, these studies were not designed to comprehensively characterize the involvement of the ECS in the pathogenesis of ASD. Therefore, we assessed the circulating levels of several endocannabinoids and delineate the correlations between their levels and disease characteristics in a large group of children with ASD and their matched controls with typical development. One hundred and eighty-six children and young adults, age 5.5 to 21 years, participated in this study. Ninety-three participants with ASD had been recruited as part of an ongoing randomized clinical trial (NCT02956226) that assesses the safety, tolerability, and efficacy of two CBD compounds in 150 participants with ASD and behavioral problems. Legal guardians of 93 participants consented to the assessment of serum endocannabinoids at baseline. Ninety-three unrelated, age- and gender-matched, control participants, attending or graduating regular education and without any neuropsychiatric diagnosis other than ADHD, were recruited through advertisements posted in the surrounding community. Participant characteristics are presented in Table 1. Vineland Adaptive Behavior Scale-II (VABS-II) . The VABS is a semi-structured caregiver interview designed to assess functional skills in five domains, each with two to three subdomains. The main domains are communication, daily living skills, socialization, motor skills, and maladaptive behavior. Social Communication Questionnaire (SCQ) Lifetime Form . This is a 40-item, parent-report screening measure. The SCQ total score comprises items assessing reciprocal social interaction, communication, and restricted, repetitive, and stereotyped patterns of behavior. Childhood Autism Rating Scale-second edition (CARS2-ST) . This is a quantitative measure of direct behavior observation consists of 15 scales that cover various aspects of interactive behavior—communication, body use, the child’s response to stimuli, and activity level. Home Situations Questionnaire-Autism Spectrum Disorder (HSQ-ASD) . This is a 24-item parent-rated measure of non-compliant behavior in children with ASD. The HSQ-ASD was translated into Hebrew with the permission of the authors using a translation and retranslation by two bilingual professionals and validated for this study. Child Behavior Checklist (CBCL-validated Hebrew version) [35, 36]. A screening tool of emotional and behavioral problems in 4- to 18-year-old children. The CBCL generates three broadband results—an internalizing score, an externalizing score (summing up non-compliant scale and aggressive behavior scale), and a total score. For this study, we used the externalizing section only. Autism Parenting Stress Index (APSI) . This is a 13-item parent-rated measure designed to assess the effect of interventions to control disruptive behavior in children with ASD on parenting stress. Social Responsiveness Scale-II (SRS-2, Hebrew version) [38, 39]. This is a 69–71 item, caregiver (pSRS) or teacher (tSRS) questionnaire, used to determine the severity of social deficit exhibited by participants with ASD. The SRS contains five subscales: social awareness, social cognition, social communication, social motivation, and autistic mannerisms, which respectively measure the ability to recognize social cues, the ability to interpret social cues, the ability to use expressive verbal and non-verbal language skills, the ability to engage in social-interpersonal behaviors, and the tendency to display stereotypical behaviors and restricted interests characteristic of autism. Clinical Global Impression-Severity (CGI-S) . This is a 7-point scale designed to measure severity of illness (CGI-S) by trained clinicians. Scores in the severity scale range from 1 (normal) through to 7 (amongst the most severely ill patients). Blood collection was performed between 10 am and 2 pm. Whole blood samples were collected into 5 mL VACUETTE® Serum Clot Activator Tubes (VWR, PA, USA), and after 30 min were centrifuged (3000×g at 4 °C for 10 min). The serum fraction was aliquoted into polypropylene tubes and immediately stored at − 80 °C. The extraction, purification, and quantification of serum endocannabinoids were performed by stable isotope dilution liquid chromatography/tandem mass spectrometry (LC-MS/MS) as previously described . Briefly, AEA, 2-AG, arachidonic acid (AA), N-palmitoylethanolamine (PEA), and N-oleoylethanolamine (OEA) in serum samples were extracted, purified, and quantified using the stable isotope dilution LC-MS technique. Total proteins were first precipitated using ice-cold acetone and Tris buffer (50 mM, pH 8.0). Next, samples were homogenized using a mixture of 0.5 mL ice-cold methanol/Tris buffer (50 mM, pH 8.0), 1:1, and 7 μL internal standard (22.4 ng d4-AEA). Following this, the homogenates were extracted using ice-cold CHCl3:MeOH (2:1, v/v) after they were washed with ice-cold chloroform three times. The samples were then dried under thin stream of nitrogen and reconstituted in MeOH. Analysis by LC-MS was conducted on an AB Sciex (Framingham, MA, USA) Triple Quad 5500 Mass Spectrometer and a Shimadzu (Kyoto, Japan) UHPLC System, while the liquid chromatographic separation was acquired via a Kinetex (Phenomenex) column (C18, 2.6 mm particle size, 100*2.1 mm). Sample levels of AEA, 2-AG, AA, PEA, and OEA were measured against a standard curve and then expressed as pmol/mL. Statistical analyses were performed using SPSS version 23 (SPSS Inc., Chicago, IL, USA) software. Continuous variables are presented as mean ± SD with the exception of the serum endocannabinoid levels that are being presented as mean ± SEM, as specified in the text. To test the differences in continuous variables between participants with ASD and neurotypical control group, the independent samples t test was performed, a correction for multiple comparisons was conducted using Bonferroni correction. The Mann-Whitney test was not needed based on normal/near normal distribution of OEA, PEA, and AEA. Associations between nominal variables were performed with the Pearson χ2 test. Pearson correlation was used to test the correlation between endocannabinoids’ levels and demographic parameters or adaptive functioning of participants. A multivariate logistic regression analysis was performed to test the independent association between the serum endocannabinoid levels and ASD status, adjusting for age, gender, and BMI, which are potential confounders. A linear regression analysis was performed to test the correlations of serum endocannabinoid levels with age, gender, and BMI. Finally, to ease clinical interpretation and sensitivity analysis, endocannabinoids were analyzed also as dichotomous variables defined by a cut-off of below the 25th percentile (first quartile) value for each endocannabinoid in the control group. P < 0.05 was considered statistically significant for all analyses. Serum levels of the main endocannabinoid AEA and its structurally related compounds OEA and PEA were lower in children with ASD versus age-, gender-, and BMI-matched control group of typically developed children. [Fig. 1; AEA 0.722 ± 0.045 vs. 1.252 ± 0.072, P = 2.9E-09, Cohen’s d effect size; 0.91. OEA 17.3 ± 0.80 vs. 27.8 ± 1.44, P = 1.2E-09, Cohen’s d effect size; 0.94. PEA 4.93 ± 0.32 vs. 7.15 ± 0.37, P = 1.4E-05, Cohen’s d effect size; 0.65 pmol/mL, mean ± SEM, these differences remained statistically significant after a correction for multiple comparisons]. Serum levels of 2-AG and its breakdown molecule AA were not significantly different between groups [2-AG 29.91 ± 5.29 vs. 18.92 ± 1.89, P = 0.12; AA 2092 ± 93 vs. 2228 ± 133, P = 0.39; ASD vs. control, pmol/mL, mean ± SEM]. Serum levels of AEA, OEA, and PEA were independently associated with ASD status when adjusting for age, gender, BMI, and attention deficit hyperactivity disorder (ADHD) status. (Additional file 1: Table S1, P = 0.001, 0.01 and 0.007, respectively). Cut-off level for AEA, OEA, and PEA were set at the 25th percentile (first quartile) value in the control group. These values are presented in Table 2 with sensitivity and specificity in ASD detection and P values. Difference in endocannabinoid levels between genders and correlations with age and BMI appear in Table 3. Younger and thinner children with ASD had lower levels of serum AEA (Table 3). However, these correlations did not remain significant after a correction for multiple comparisons. No other significant correlations of AEA, OEA, and PEA with age and BMI or associations with gender were found. Correlations of circulating AEA, OEA, and PEA levels with adaptive functioning and associations with ADHD, epilepsy comorbidity, use of medications and history of prenatal complications are presented in Table 4 and Figs. 2, 3, and 4. No significant correlations or associations were found. Some tendency toward a correlation was observed for AEA with APSI (R = 0.19, P = 0.06) and with use of antipsychotic medications (R = 0.18, P = 0.07). Children with higher APSI severity score or with higher use of antipsychotics had lower AEA levels. This study provides evidence that serum levels of certain endocannabinoids are substantially decreased in people with ASD across age groups, adaptive functioning, BMIs, and in both genders. The most studied endogenous ligands of CB1R and cannabinoid type-2 receptor (CB2R) are AEA and 2-AG. We detected decreased serum concentrations of AEA and its structurally related compounds OEA and PEA with no significant differences in serum 2-AG and its breakdown molecule, AA. OEA and PEA are widely distributed in the CNS, but their classification as endocannabinoids is debatable, given their lack of affinity for CB1R and CB2R. Similar to AEA, they are, however, agonists for PPARα and GPR119 (Fig. 5). Endocannabinoids are not stored in any cellular compartment for later use. They are generated on demand at the post-synaptic neuron cell membrane and are rapidly inactivated by pre-synaptic neuron cellular uptake and enzymatic hydrolysis (Fig. 5). As a result, the concentrations of the various endocannabinoids in the brain are constantly regulated, and even small changes might be clinically meaningful and reveal brain pathology. Circulating endocannabinoids are believed to come from multiple organs and tissues, including the brain, skeletal muscle, adipose tissue, liver, and kidney as well as circulating cells . However, plasma endocannabinoid levels were demonstrated to reflect brain concentrations , and hence these biomarkers are not only accessible, easy to measure, and cost-effective but can also shed a light on the pathophysiology of CNS disorders. Indeed, dysregulation of the ECS was demonstrated in many different models of ASD  and some of these studies convincingly illuminate previously unknown pathophysiological mechanisms. For example, prenatal exposure of rats to valproic acid is known to induce selective deficits in social play behavior and stereotypies in the offspring. In a recent study, prenatal exposure of rats to valproic acid was demonstrated to alter phosphorylation of CB1R, and enhancing AEA signaling through inhibition of its degradation reversed the behavioral deficits displayed by valproic acid-exposed animals . Despite extensive evidence of the involvement of the ECS in animal models of ASD, human studies are sparse. 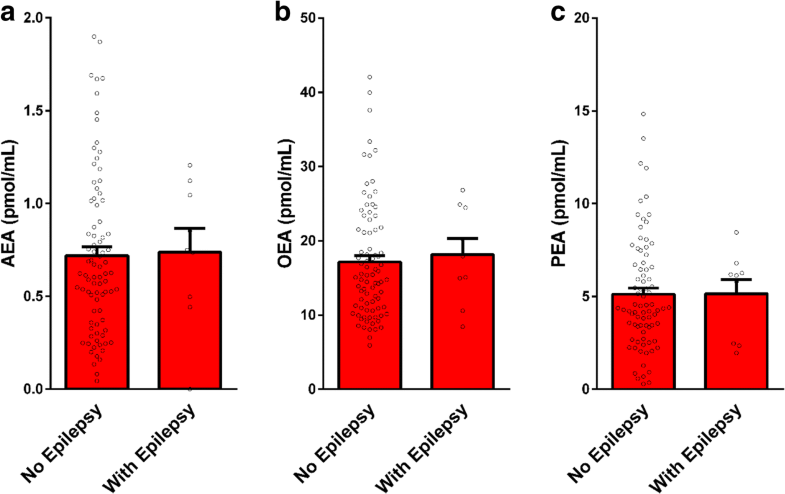 Recently, Karhson and colleagues demonstrated lower levels of AEA in stored plasma samples of 59 young children (aged 3–12 years) with ASD and 53 neurotypical children (P = 0.034). This study was not powered to determine the relationship between plasma AEA concentrations and ASD symptom severity. 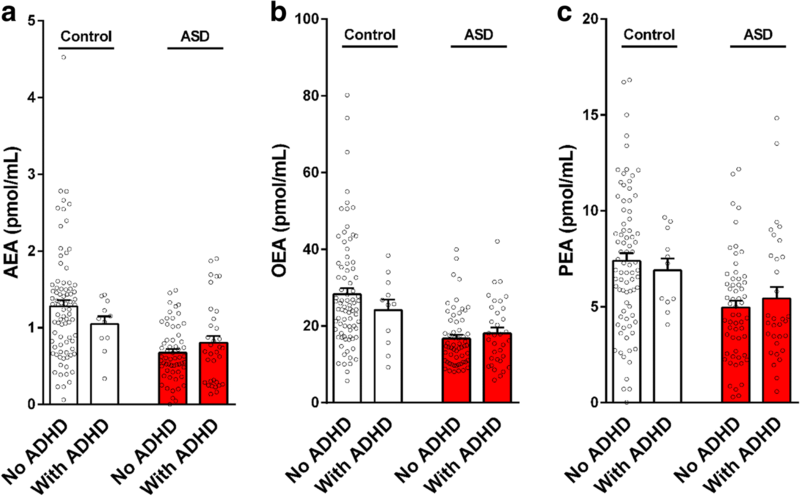 The current study corroborates their finding of lower circulating AEA levels in ASD in a larger cohort and older age group, and indicates that substantial difference exists also in the levels of the AEA-like molecules PEA and OEA, but not in the levels of the other principle endocannabinoid, 2-AG. Future studies should explore possible explanations for these findings such as reduced activity of N-acyl phosphatidylethanolamine-specific phospholipase D (NAPE-PLD), the enzyme that synthesizes these 3 endocannabinoids, as was suggested by Siniscalco et al. or increased activity of fatty acid amide hydrolase (FAAH), the enzyme that degrades them. Notably, dysregulation of the ECS have been also implicated in the pathogenesis of epilepsy [46–48], leading eventually to phase 3 clinical studies of CBD, a non-psychoactive phytocannabinoid, for refractory epilepsy [49–51], and the recent approval of CBD by the US Food and Drug Administration to treat severe forms of epilepsy (Lennox-Gastaut syndrome and Dravet syndrome) (https://www.fda.gov/NewsEvents/Newsroom/PressAnnouncements/ucm611046.htm). These findings are of specific importance for people with ASD, as 10–30% of people with ASD have comorbid epilepsy , and several synaptic plasticity pathways appear to be involved in both disease processes . Moreover, our findings point to a theoretical mechanism by which CBD might compensate for ECS dysregulation in ASD. Similar to OEA and PEA, CBD has a very low affinity to CB1R and CB2R and like AEA, OEA, and PEA it may exert its CNS effects by activation of PPARs and TRPV1 [53, 54]. CBD also inhibits the enzyme FAAH [54, 55] and leads to increased levels of AEA, OEA, and PEA (Fig. 5). Therefore, our study proposes a theoretical pathophysiological mechanism for CBD in ASD and support the rationale in the ongoing and emerging clinical trials of CBD in ASD (NCT03537950, NCT02956226, NCT03202303). Finally, this study has several limitations. The age range of the cohort and the adaptive level of the ASD participants were relatively wide. We could not completely control the effects of ASD comorbidities and the medications’ effect as most of our ASD participants received medications, and some medications could impact the levels of circulating endocannabinoids. In addition, we did not assess genetic, electrophysiological, and imaging biomarkers. We found lower levels of the endocannabinoids AEA, OEA, and PEA in serum samples of 93 children with ASD compared with samples of matched neurotypical control group. These findings are in line with the results of numerous former studies in animal models of ASD as well as an initial human study that demonstrated lower endocannabinoid tone in ASD. 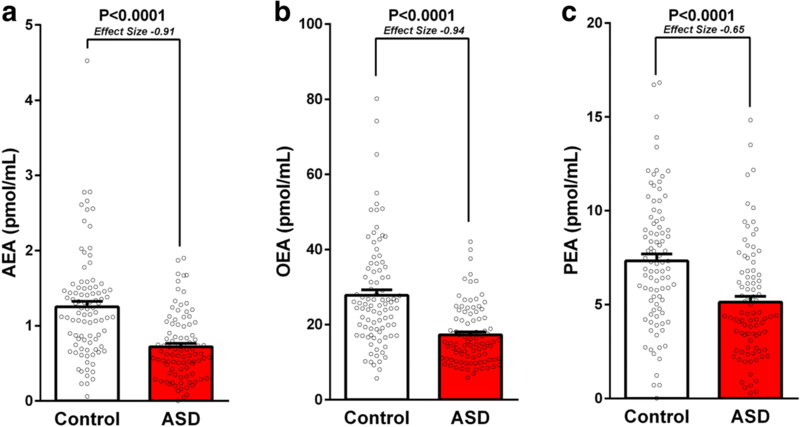 Our findings suggest the use of circulating AEA, OEA, and PEA as stratifying biomarkers of ASD and future studies should assess the clinical significance of this stratification. These markers can also be easily measured longitudinally in humans and in animal models alike, and future studies should evaluate their potential to assist in the monitoring of treatment response. Further studies are needed to determine whether circulating endocannabinoid levels are also lower in infants and can assist in pre-symptomatic diagnosis and if they reflect lower endocannabinoid tone in the brain, as found in animal models of ASD. This research was supported by the National Institute for Psychobiology in Israel (#203–17-18), BOL pharma, Revadim, Israel, and the Israel Science Foundation (ISF grant #617/14). The funding bodies were not involved in any way in the study design, collection, analysis and interpretation of data or in the writing of the manuscript. AA and JT designed the research study. AA and JT secured funding for the research. AA, MH, HC, NW, and LP recruited and/or performed the clinical phenotyping of participants. AA oversaw the blood sample collection and provided the banked samples. ME and AN performed the endocannabinoids’ measurements. ST performed the advanced statistical data analysis. All authors contributed to and approved the final manuscript. All research procedures were approved by the Shaare Zedek Medical Center Review Board and Israeli Ministry of Health prior to participant enrollment. Participants’ parents provided written consent prior to initiation of any experimental procedures, and written assent was obtained from participants when appropriate.